Mercedes is back to what it does best, that is making exclusive and extravagant models. 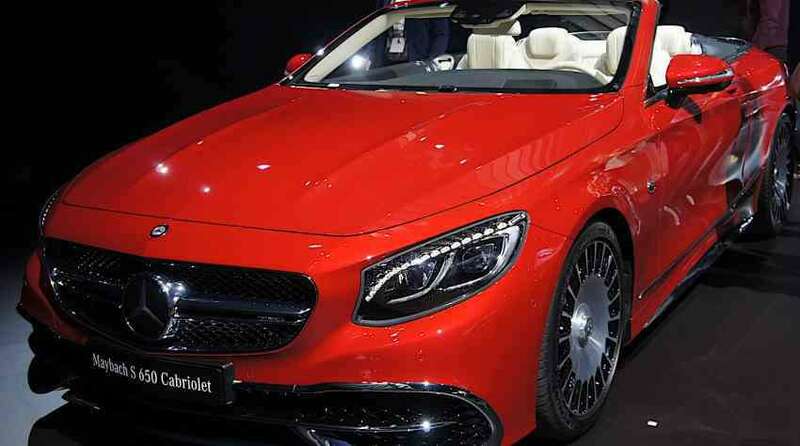 Mercedes-Benz added price and exclusivity to the top of its model line at the Los Angeles auto show on Tuesday with the $300,000 Mercedes- Maybach S 650 convertible and several new models from its Maybach performance brand. Maybach S 650 Cabriolet is a pumped up version of the Mercedes S class convertible that went on sale this year. LED headlights with Swarovski crystal, 20 inch wheels and Maybach exclusive wood trim gives it that touch of opulence. In case owners momentarily forget how special the limited edition four-seat convertible is, an inlay on the wooden center console declares each S 650 to be “1 of 300.” A mere 75 of those cars will come to the United States. Every Maybach comes with a set of custom luggage trimmed to match the car’s interior. The S650 features a 6.0L twin-turbo V12 engine that produces 621-hp and has been tuned for smooth, effortless delivery of power. It will come in Zircon Red, Cote d’Azur Blue and Diamond White. It has dual-display setup as found in the aforementioned S-Class, along with the Burmester sound system to get you started. It also gets the warm air cushion for when you drive with the top down, ventilated seats and the signature special leather seats woven with the internal fragrance system. Of course, you can expect that the lucky 300 buyers will also get access to Mercedes’s ‘mbrace’ connected concierge platform. It pits itself against the Rolls-Royce Dawn and the Bentley Continental GTC. Mercedes also unveiled the AMG E63 S 4Matic performance sedan at the LA show. The all-wheel-drive midsize sedan has a 612-hp 4.0L twin-turbo V8 and accelerates to 62 mph (100 kmh) in 3.4 seconds. U.S. performance figures aren’t available yet, but expect the E 63 S to shave 0.1 second or so off its Euro-spec test result. A nine-speed automatic transmission helps distribute power to both axles.